A couple of weeks ago, I was in Los Angeles for a conference with work. 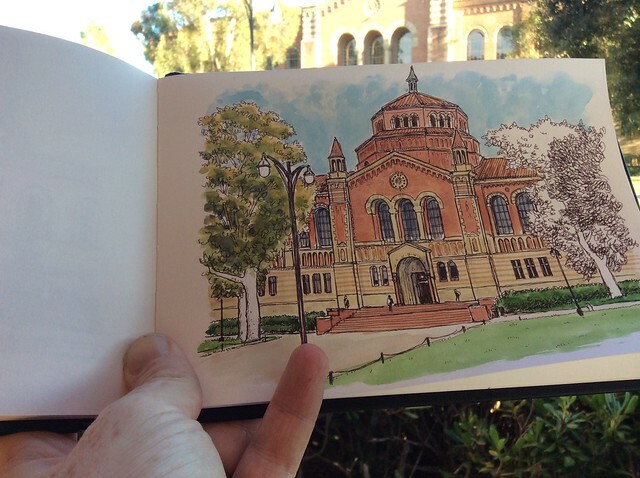 It was at the UCLA campus in Westwood, and I had never explored UCLA before, so I made sure to bring my sketchbook. UCLA’s campus is pretty big, but it feels even bigger because it’s got a lot of hills and steep climbs; I think if I worked here, I’d be a lot fitter. UC Davis is very flat, very bikeable, spread out but nothing too far from anywhere. I did get a little lost at UCLA. At one point, while wandering about with my map, one student did stop and help me out. I’m glad he did, because I was convinced I was in one place but was in fact in the complete other direction. I found my way around in the end. The conference was just for one day, and the workshops were short. One particular time slot had nothing relevant to me (except for one slightly interesting workshop that filled up immediately), so I took that opportunity to get briefly lost on campus before finding Royce Hall (below), an epic building in an epic location. 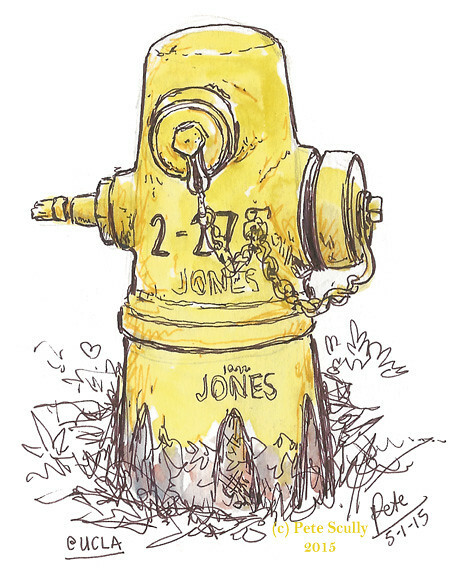 I sketched away as quickly as I could, before dashing back to the next session, and added the colour later on. 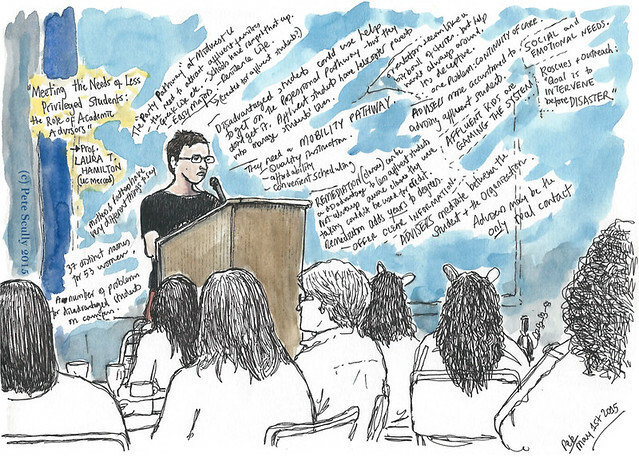 I did do some sketching during the workshops, but this one below was of the Keynote Speaker. This was the UC Academic Advising Conference, and the speaker was Laura Hamilton of UC Merced, talking about her research into the inequalities inherent in the university system in the US, and how we can meet the needs of underprivileged students. It was a fascinating talk and worth the trip down there alone. I took a lot of notes. After the final workshop was over we all dispersed, and I headed back up to where Royce Hall was to do a bit more. 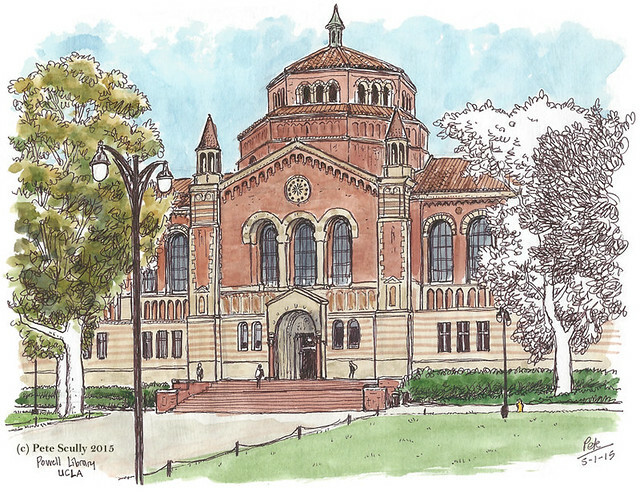 I also sketched the beautiful building opposite, Powell Library (see below, and the top image of this post). I stood in the cool arches of Royce Hall, in this very tranquil spot. 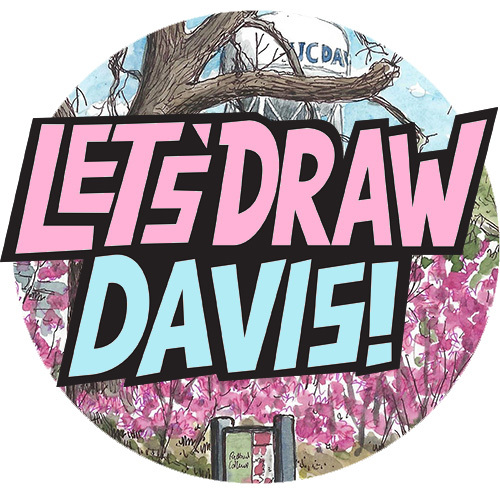 As someone who has sketched UC Davis rather a lot, it was fun to be able to draw a different campus in our UC family. UC by the way means ‘University of California’. These particular buildings date back to when the Westwood campus opened in 1929 (though UCLA itself is a little older). 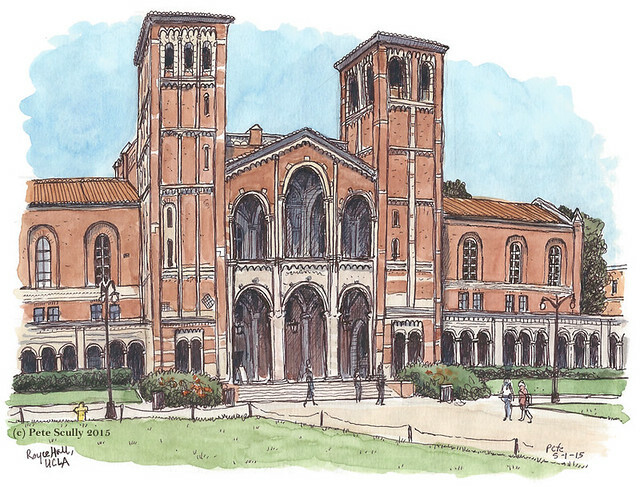 Here is a little history of UCLA: http://www.ucla.edu/about/history. Why are two girls at the lecture wearing animal ears? I was hoping nobody would ask. I never found out, but quite a few were doing the same. UCLA was very cool, and I liked Westwood a lot. Definitely be back sketching LA.